Uber has been met with a mix of excitement, anger, protest, legal action and dispute when introduced in most countries. With operations in over 250 cities, the ride-hailing app has disrupted transportation and models of work. It has also been disrupted by the termination of all or part of its services in some countries including France, Italy, Spain, Germany, Denmark and China. London is the latest location where Uber is facing serious challenges. Transport for London, the city’s transport authority, has denied it a new licence to operate, which would effectively shut down the company’s operations in London. Uber has initiated an online petition to reverse the TFL decision. However, there are deeper issues that need to be considered. Uber’s problems are a classic example of a digital business that has evolved without fully taking into account its impact on society. It’s a digital platform that plays an ambiguous role as intermediary between drivers and customers – repeatedly emphasising that it is not an employer. In fact, drivers are considered a customer for Uber – they pay 20-25% of their earnings to the company. Yet the values embedded within Uber’s business model and app design have proven to be problematic. In my ethnographic research about Uber in London, I conducted interviews with drivers over the course of 850 minutes of Uber rides, covering 318 miles, and speaking to 33 drivers, mostly in the London area. I also spoke to a range of customers and other types of taxi drivers, and examined different legal documents, news items and public interviews. Drivers were people in need of money who used Uber as source of employment. For most, Uber work was their only job despite the uncertainty involved. I found that most drivers perceived themselves as lacking in skills; Uber driving was a way out from this difficulty and a way to earn money while in London. Drivers consistently compare themselves to other taxi drivers and feel largely inferior in status, earnings and work conditions. They work 10-14 hours per day and went for long periods without breaks. Many spend the whole day behind the wheel, anxious they will lose a job if they stop for food or drink. Drivers expressed resentment at their low pay and need to work such long hours to cover operating costs (renting or leasing a car, petrol, weekly car wash, smart phone rental, insurance), as well as to make a living. 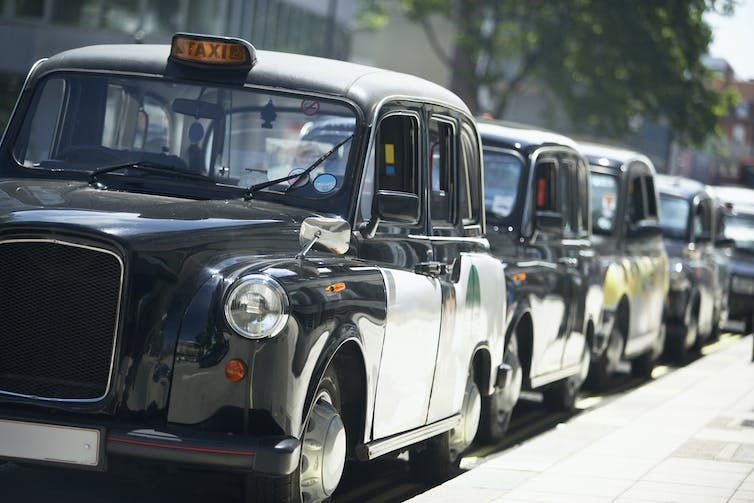 Comparing themselves to their peers, and in particular London’s black cab drivers, they found that cabbies work less, earn more and live a much better life. They also had high regard for black taxi drivers for their knowledge and felt very lacking in skills in comparison. Many felt conflicted about the app’s surge pricing feature, which charges customers more during peak times. It made them feel like they were exploiting people and expressed discomfort at this. But they rationalised it by differentiating between themselves and the app, whose conditions they work under. They gave me tips on how to avoid surge prices and trick the apps’ algorithm to go back to standard price. I observed that the Uber drivers were skilful and entrepreneurial. They constantly use new strategies to survive and make a living. For example, they would try to gain better visibility of their competition by using the customer version of the app at the same time as the driver version. They try to predict where Uber taxis will be likely needed with the least competition from other Uber taxis. They would also try to get the best possible deal for renting or leasing a car. They try to find other modes of employment for other taxi companies to have a more secure base for their life. However, the inferiority and resentment that drivers have, as a result of their low pay, long hours and the hostile environment, makes technological adaptations necessary. Arguably, this will also be needed if Uber is to keep drivers to a level that meets the demand from customers. Like any other technology, the Uber app, comes with embedded values. Research shows that a gap of values could occur when those embedded in the technology differ from the values embedded in the organisation or society. The solution could be either to change the technology to suit the needs of society, a change in societal views to suit the technology or for some form of mutual adaptation to take place where both technology and society change to accommodate each other. The values embedded in Uber are focused on disruption and blind competition. The app appeals to customers through low prices and convenience. But it comes at serious cost to drivers who work under an extreme “work more, earn more” model where they must grab work at every opportunity and constantly face unknown competition. The app does not limit working hours for drivers per day, enforce a day (or two) off per week or limit the number of consecutive hours a driver can work. The app is also designed to be a race between drivers to be in the right place at the right time and accept the job before anyone else. It is designed so drivers cannot see each other in the area – and so they operate under unknown competition and high uncertainty. The dilemma for a digital platform like Uber is to continue to appeal to customers, while providing better conditions for drivers. If changes are required to renew its London license, now could be the time to incorporate values that honour both sides of its customer base. The technology of the Uber app has enabled it to be incredibly effective in winning market share, but it needs better values built into it to protect both drivers and customers.